Recipes seem so easy when you explain everything....no cream...I'm one of those that shouldn't eat dairy but sample every once in awhile and suffer for days...me bad! Thanks, there are many alternatives to cream and this is one I enjoy, you can add it to sauces also(but best to buy the puréed one from the store as it's smoother). Thanks for the recipe, Ivan. I'm really looking for ways to up our vegetable intake and to learn to broaden the variety of vegetables we eat. So I'm going to add celery root to my grocery list and try this soup out. I like "filling!" Thanks, I am the same and a soup is a good way to eat lots of veggies!! Wait! I haven't made my crustless goat cheese tart yet, and now you give me another delicious recipe! It's fine... they go together! I was thinking the same thing! The next cold day I'm making both. That sound really great, I love to make soup. Thanks, pleased you like it and I also enjoy making soup! Soup of the evening, beautiful soup. I got sidetracked into reading your other soup recipes, particularly appreciate that you thicken some sans flour. Gluten-sensitive people thank you. Thank you, happy you like the alternative thickener, as I said above it is good to thicken sauces also. We are both fans of soup here - especially at this time of year. I have never tried celery soup before. AGA dislikes eating celery but this could change his views. I am a celery fan, hope the AGA likes it but it is a bit full on with all three celeries! Good luck in changing his mind! I suppose you could do a mix root vegetable soup to start. Thanks, I make soup maybe three times a week and it is good to use up leftovers also. I use a hand blender as it is quite dangerous with the steam (a friend burnt his face once as it was too full!). Be careful - that must of hurt a lot. The soup looks delicious and the addition of cashew nut paste sounds intriguing. 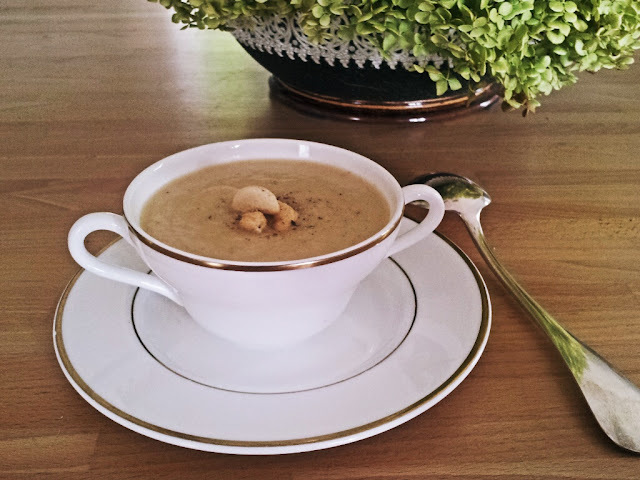 Thank you, the cashew nuts add a creaminess with out the cream (healthier as no cholesterol but higher in calories). I can recommend a hand held blender if you are making soups - I have one that unclips, so goes in the dish washer and a tiny blender which is also really useful. Go for the highest power if you have a choice. Hi Ivan and Hi Aston! Wow! I loooove soups and this one seems to be a wonder for winter time! I'll try, be sure! Thanks for sharing your delights! Let me tell you Rebecca( don't smile :)))) but this is my sweet pug's name ), was ill with a conjunctivitis that time consuming to improve. The vet prescribed an antibiotic eye but only now it is improving. I was very worried because he said if it doesn't improve it could be glaucoma. Rebecca has only 8 months and our hearts were very tight. Now, finally she is improving and the heart is lighter. uff And how is Aston? Hope sweet as always. Hugs for you and woofs to Aston from Rebecca! Thank you, poor little Rebecca - I hope she gets better soon. Pugs often have eye problems, Aston's eyes are washed every week to try and help. He has a lot of problems with his back legs sadly, the same as my pugs before :(. We will have to have a scan soon to see if there is anything to be done. They are a worry... but we wouldn't change them! Hello Ivan. This soup sounds very interesting and would be perfect for us! And as Ron mentioned no cream.....even better for him! Thanks for this. Happy you like this, I though this would suit you. Needless to say the cashew paste is good in most things where you may want to substitute cream. I think Tahini would work too, don't you? I would think so (good idea! ), it may need a bit extra as the cashew paste is very thick - one of us will have to test it and report back!! Thank you so much For another great recipe. I love celery and this will certainly hit the spot. Also thank you for a gluten free recipe at that !!! My pleasure, there seems to be a need for more gluten free - so watch this space! Thank you for stopping by, pleased you liked the combination... I try!! Hello! new to your blog, but I love it! !I am extremely fond of celeriac so I am very keen to try this recipe....wondering if almond butter would substitute for the cashew puree'? what do you think? I am also going straight out to get the ingredients for the chicken braise...we are very dreary here in New Hampshire and I am in need of some light, yet warming dishes! would absolutely love it if you would stop by, plus, I also have a FB page that has more comments and posts about my design work. Thanks for getting back to me also, I have just been over to your website and I look forwards to reading more of your blog in the future - really wonderful taste you have. I am not on Facebook but should be! !